75. 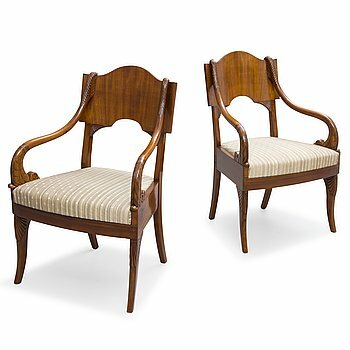 A PAIR OF RUSSIAN ARMCHAIRS, empire early 19th century. 76. 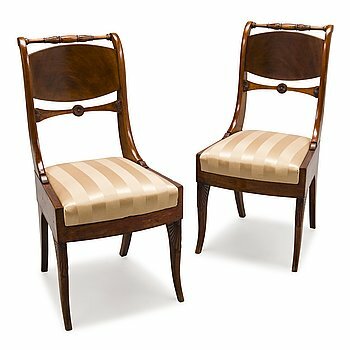 A PAIR OF CHAIRS, late empire, Russia, first half of 19th Century. 78. 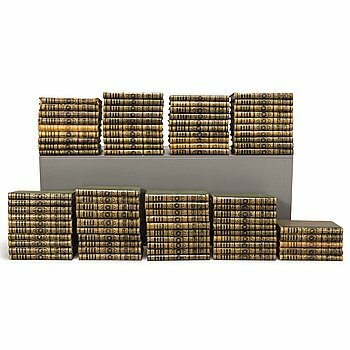 THE BROCKHAUS AND EFRON ENCYCLOPEDIC DICTIONARY, 84 pieces. 79. 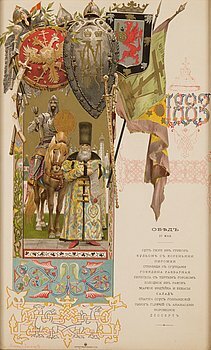 ALEXANDER IIIs CORONATION MENU. 80. 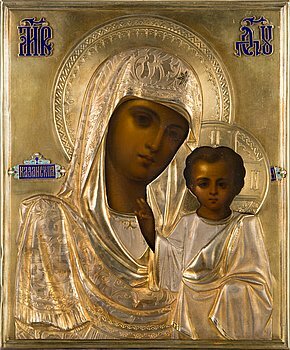 An early 20th century Russina icon. 81. 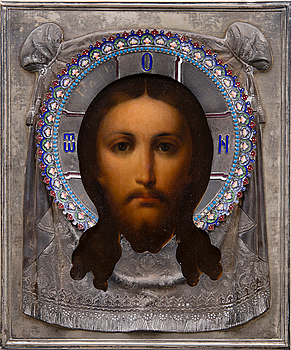 An early 20th century Russin icon. 82. A RUSSIAN SIX PIECE SERVICE, porcelain "tête-à-tête", Kuznetsov Dulevo factory 1891-1917. 83. 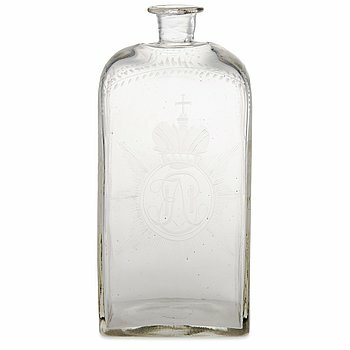 GLASS BOTTLE, Russia, early 19th Century. 84. AN EARLY 19TH CENTURY RUSSIAN ENGRAVED GLASS GOBLET. 85. A RUSSIAN SILVER AND GLASS BUTTER DISH, Carl Gustav Ekqvist, Saint Petersburg, 1850s. 86. A CIGARETTE CASE, silver (88) and cloisonné enamel, Ovchinnikov, Moscow 1887, Russia. 87. A CIGARETTE CASE, silver, gold and enamel, Hlebnikov, Moscow, circa 1910. 88. A GIGARETTE CASE, silver. Albrecht Kirill, St Petersburg 1874-1898. 89. A SUGAR BOWL, silver, Nichols & Plinke, Saint Petersburg 1860, Russia. 90. A SUGAR BOWL, silver, Carl Anton Carlborg, Turku 1823, Finland. 91. A parcel-gilt silver sugar box, marked JB, mark of assay master Ivan Vonifatiyevich Yevstigneyev, Saint Petersburg 1880. 92. 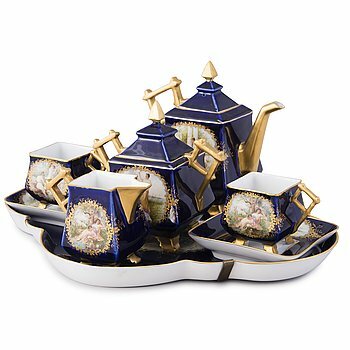 A Russian five-piece tea and coffee set by Carl Johann Tegelsten, Saint Petersburg 1841-44. 93. A Russian silver tea glass holder, probably Pavel Ivanovich Egorov, Moscow 1880. 94. A Russian silver samovar by Johan Ferdinand Olsonius, Grachev, Saint Petersburg 1882. 95. A TANKARD, silver, partly gilt, Moscow 1862, unidentified goldsmith C.B.C. 96. A RUSSIAN WINE PITCHER, silver, Adrian Ivanov, Moscow ca 1900. 97. A RUSSIAN SILVER BREAD BASKET, Moscow 1871, makers mark М.Ш. 98. A JAM SPOON, gilt silver, Alexander B. Lyubavin, Saint Petersburg, 1910s, Russia. 100. A RUSSIAN ORMOLU CANDLESTICK. 101. A RUSSIAN IMPERIAL PORCELAIN FACTORY FIGURINE, porcelain, from the time of Nicholas II 1911. 102. FIGURINE, bisque porcelain, Gardner, Moscow, c. 1860-70-talet. 103. A RHYTON VASE, probably Imperial Glass Factory, Russia, first half of 19th Century. 104. A PEN, sapphires, rubies, 14K (56) gold. Russia 1899-1908.